1. The poster board surface area is a maximum of 48 inches wide by 48 inches high. 2. A Poster Number, pins and Velcro material to affix your poster to the display boards will be provided for you. 3. In preparing your poster, we suggest that you limit the amount of printed material to the least possible. Posters should not be elaborate, nor need they be expensive. If supplemental material is desired, you may hand out information sheets to those viewing your poster. 4. Poster material must be prepared in advance and should be large enough to be viewed from a distance of 3.28' (1 meter) or more. 5. 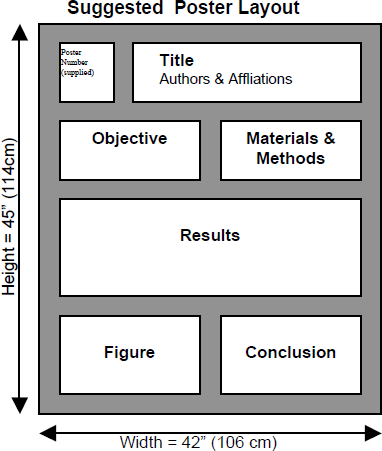 Each poster must have a top label indicating the title of the paper, the names of the authors and their affiliations. The size of the characters for the title should be at least one inch high. Keep illustrative material simple. Charts, drawings and illustrations may be similar to those used in slides - preferably with bolder, heavier figures. Simple use of colour can be used to add emphasis. Posters should be mounted on stiff paper - but NOT on heavy cardboard. 7. Simple "Introduction" and "Conclusion" sections are helpful. When feasible, use graphs for depicting qualitative relationships, and tables for precise numerical values. Photographs should be in a matte finish, not glossy. 8. All posters must be written in English. 9. Do not fold posters; try to carry them in an appropriate container. Do not mail poster presentations in advance; bring posters with you to the Conference. 10. Conference staff will be present to assist you. Presenters are required to be at their poster during the Poster Presentation on Monday, April 23rd, 2018 from 12:30 pm – 1:00 pm and Tuesday, April 24th, 2018 from 12:45 pm – 1:15 pm. Posters not removed by 2:30 pm on Tuesday, April 24th will be held at the registration desk until the end of the conference when they will be discarded. The IFAE Conference cannot accept liability for lost or damaged posters.